The Moda Silk club set is a stylish ladies set with bold lines, great looks, and cutting-edge technology making it one of the best in its category. The set features an offset 460cc titanium 15° driver with a huge sweet spot and hot face that will help you to hit longer, straighter drives. The oversized, offset and low profile stainless steel fairway woods have an extra heavy sole and low CG to help you get the ball easily into the air from anywhere on the course. The stainless steel hybrids have a deep, low CG for higher, more accurate and forgiving shots while the oversized stainless steel irons offer extreme perimeter weighting and a wide undercut cavity that moves the center of gravity back and away from the face to help you hit higher, more accurate shots, even on off-center hits. 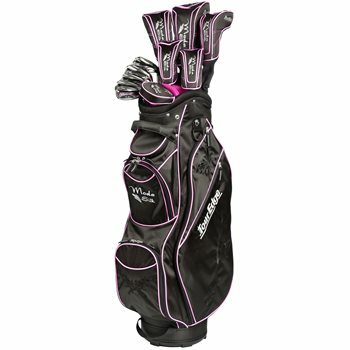 The club set includes a 15° driver, #3 wood, #5 wood, 5-6 hybrids, 7-SW undercut cavity irons, putter, deluxe cart bag and headcovers.